Illinois State’s latest crop of visiting students from Brazil are digging deep into the science of horticulture this summer through an internship at the University’s outdoor laboratory. The three Brazilian students are getting hands-on experience at the Horticulture Center, the Department of Agriculture’s hub for horticultural instruction and research. They’re learning directly from ISU’s horticulture experts, while also getting to manage their own projects at the 10-acre site on Raab Road. The three students came to Illinois State through the Brazil Scientific Mobility Program (BSMP), a one-year, non-degree program for Brazilians to study abroad in the U.S. It’s funded by the Brazilian government and administered by the New York-based Institute of International Education. More than 125 Brazilians have studied at Illinois State since BSMP launched in 2011, all learning in the science, technology, engineering, or mathematics (STEM) fields. 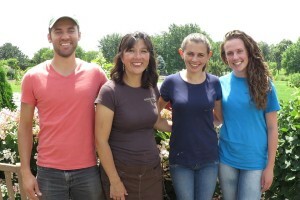 Horticulture Center Director Jessica Chambers, second from left, and the three Brazilian students doing an internship there this summer. Daniela Herzog is one of the visiting students. The agriculture student arrived at Illinois State in August 2014. Like her peers, she started by learning English at the English Language Institute. She’s enjoyed working with Chambers and says many of the skills she’s learning can be applied back in Brazil. The Horticulture Center is also open to the public and hosts outreach events throughout the year, and Herzog’s favorite part of the internship so far has been working with the center’s volunteers. Chambers’ mother was born in Colombia and later earned her Ph.D. from Illinois State. Since 2011 the visiting Brazilian students have become very involved all across campus, said Assistant Provost Rita Bailey ’90, M.S. ’92, Ph.D. ’02, who oversees international studies. Contact STATEside’s editor at rmdenha@IllinoisState.edu.